FairForest helps your forest project to become more social, biodiverse, resilient and financially successful. Track and improve your social-, environmental and financial project performance on the basis of the free available metrics catalog. You provide us standardized information about your project and we will rate the holistic project performance and create a rating report. OpenForests verifies your rating report information in a desk review and in a field visit. Why should I track and report the project performance? Knowing more about your project will help you to identify the areas where the project performance can be improved. Showing best practice management in a transparent way builds up trust towards stakeholders, clients and investors. What is the output of the rating? For each project we create a comprehensive rating report which includes a summary, a rating overview, a report for each section and an annex with all questions and answers. 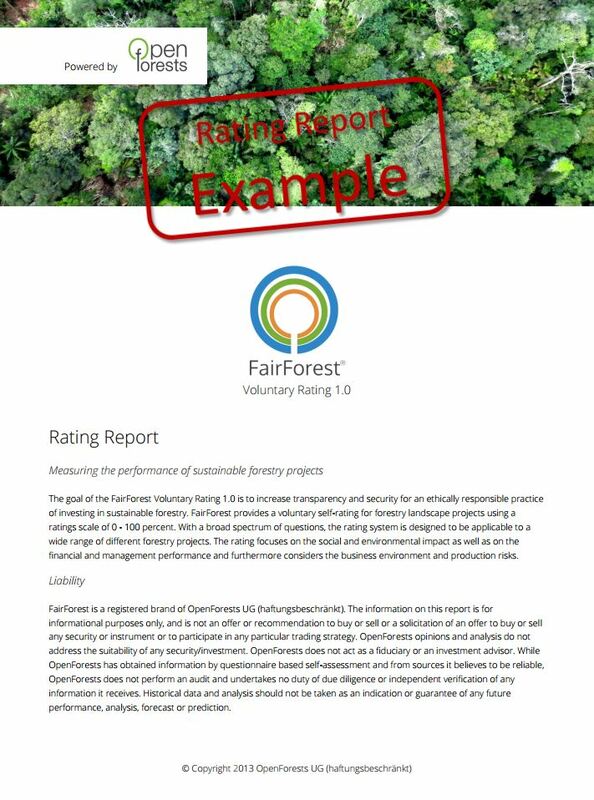 After the successful rating procedure, a project can use the FairForest Voluntary Rating or Verified Rating logo within their public communication. A summary of the report, the rating date and your unique and anonymized rating identification number will be published at the FairForest registry. Everyone with the report can now verify the rating status of your project. FairForest Metrics aligns with the IRIS metrics. IRIS is the catalog of generally-accepted performance metrics that leading impact investors use to measure social, environmental, and financial success, evaluate deals, and grow the credibility of the impact investing industry. Responsible investing into sustainable forestry requires a solid and standardized information situation. In this use case we outline how investors, fund managers and forest project developers use FairForest in their daily work. In order to strengthen the sustainable forestry sector, this white paper describes how FairForest helps to connect responsible investors with sustainable forestry projects.